Ice dance and dance in general often require the ideal “dancer’s body”. The measures that skaters and dancers take to get this “dancer’s body” can be extreme and dangerous at times. Since ice dancing is a sport, it’s more important than ever to protect your body to help ensure its longevity. Ice dancing is becoming more technically difficult all the time. This really takes a toll on the body, increasing the risk for injuries. Therefore, fueling your body through healthy nutrition is one of the best things you can do to lengthen your career. As a dancer, athlete, and fitness specialist, finding great clothes that fit these areas has been a priority. Until I found Ellie activewear, most of the good brands I found were very expensive. Also, I love to feel stylish in what I’m wearing. With every piece of Ellie clothing, I feel stylish. As a dancer, I look for sleek, form-fitting, supportive clothes with interesting straps and back designs. As an athlete, I like fun, sporty-but-stylish designs that I can wear to or from the rink or whatever activity I’m doing. As a fitness specialist, I like unique, stylish tops and bottoms that are perfect for working out in and fun to wear. I found that Ellie’s versatile activewear line has tops and bottoms that are perfect for all of these areas, whether it’s just for dance or whether it’s for your sport and working out. Once you become a competitive skater, it can help you grow in many areas of life if you train for a competition properly and use the competition as a learning experience. Leading up to any competition, you should utilize your practice time well. If you are in a lesson, focus as much as possible, and make notes after your lesson that you can use before your training sessions on your own. Most of us listen to music every day. However, if we were asked what would be good music to perform to, would it be easy to answer? Maybe or maybe not. Whether you’re choosing music for a show performance or for a competition program, here are some tips for choosing music, especially in figure skating. 1. Start with finding a notebook and pen. 2. Write down any pieces of music you really like and make you feel like moving. 3. Listen to these pieces of music while standing up (if you have the pieces of music – or you can search for and listen to them on the Internet). See how the songs make you feel, if you naturally begin moving to them, and if you can imagine skating to the music. Everything I’ve heard about Evan mentions his intense work ethic and drive. He dedicates much of his time to being in peak physical and mental condition. On occasion, his coach, Frank Carol, has told Evan to stop running his program so many times. His hard work really paid off when he became the first American man to win an Olympic gold medal since Brian Boitano in 1988. Evan is celebrating his success by purchasing an Aston Martin DB9! 2. Focus on every aspect of your skating. Evan has worked hard to develop his overall skating skills. Not only is he a strong jumper, but Evan’s spins, jumps, footwork, and artistry help him be one of the best male skaters in the world. Even though Evgeni Plushenko, the gold-medal favorite going into the Olympics, landed his quad in both the short and long programs, Evan topped his score because of a stronger overall long program. 3. Nice guys do finish first. Nobody likes to lose. . . . Plushenko is a great guy, a great skater. I’ve admired him for years. I thought he did an outstanding job . . . For him to discredit the field, though, that’s not right. It’s probably the strongest men’s field there’s ever been, and I was honored to be in the field. I guess I was a little disappointed that someone who is my role model would take a hit at me in what is probably one of the most special moments of my life. 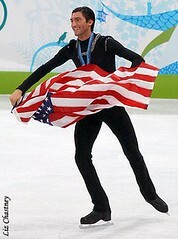 Evan’s qualities as Olympic champion are important qualitities to have, not just as a skater but as a person. What do you find to be Evan’s most inspiring quality? We're Will, Chea, and Christina Chitwood. We hope ChitwoodSkating.com will give you inspiration as well as figure-skating information. We welcome your comments about any of our posts as well as skating questions you would like answered here on our blog. Please see the About Us page for our bios. For our skating students and parents, please see the Upcoming Events page for information about upcoming test sessions, competitions, and/or ice shows. Photos are copyrighted to the individual photographer. Please do not use without permission. Header photo of Aaryn Smith and Will Chitwood from 2006 U.S. Figure Skating Championships. Photo by Robert A. Walker. Photos are copyrighted to the individual photographer. Please do not use without permission.